Gulf Coast Orthopedics: Geoffrey P. Stone, M.D. Dr. Geoffrey P. Stone specializes in open and arthroscopic Shoulder, Elbow, and Sports Medicine surgery. He received his undergraduate degree from Millsaps College with a B.S. in Chemistry. He received his medical degree from the University of South Alabama College of Medicine in 2009. 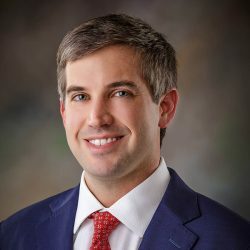 Dr. Stone completed his orthopaedic residency at University of South Alabama Department of Orthopaedic Surgery in 2014, during which he had the privilege of training under Dr. James Andrews for his sports rotation. After residency, he completed an ASES (American Shoulder and Elbow Surgeons) accredited fellowship in Tampa, FL at Florida Orthopaedic Institute, training under world renowned physicians: Dr. Mark A. Frankle and Dr. Mark A. Mighell. Following his fellowship, Dr. Stone completed additional shoulder training in France with Dr. Philippe Collin, Dr. Laurent Lafosse, and Dr. Pascal Boileau learning advanced arthroscopic techniques. As an expert in the field of shoulder surgery, Dr. Stone has published several book chapters, as well as several Pubmed reference journal articles regarding shoulder surgery. In 2015, he received two nominations for the prestigious Charles S. Neer Award as a result of his research. Dr. Stone is a member of the American Academy of Orthopaedic Surgeons, Arthroscopy Association of North America, and the Alabama Orthopaedic Society. He is currently on staff at Terrebonne General Medical Center, St. Anne’s Hospital in Raceland, Gulf Coast Surgical Center and Physicians Specialty Surgical Hospital. In his free time, Dr. Stone enjoys spending time with his family, fishing, and golf.